13 February 2016 "The Paranormal View"
"In January 1967, shortly after Jim Garrison in New Orleans had started his prosecution of the CIA backgrounds of the murder, the CIA published a memo to all its stations, suggesting the use of the term 'conspiracy theorists' for everyone criticizing the Warren Report findings. Until then the press and the public mostly used the term 'assassination theories' when it came to alternative views of the 'lone nut' Lee Harvey Oswald. But with this memo this changed and very soon 'conspiracy theories' became what it is until today: a term to smear, denounce and defame anyone who dares to speak about any crime committed by the state, military or intelligence services. Before Edward Snowden anyone claiming a kind of total surveillance of internet and phone traffic would have been named a conspiracy nut; today everyone knows better." I started out, oddly enough, reading out a few bits from articles on	Conspiracies that turned out to be Conspiracy Fact. I tried to convey the concept of the dystopian short subject film Smart Card, but apparently didn't do a good job explaining it. CC brought up those who curiously believe the Earth is flat "theory," and that heat can't travel from the sun as "heat cannot travel through space," et al. Henry brought up the concept of global warming. Skype was being very tempermental with me this evening, temporarily disconnecting me, as well as outright booting me from the call. During my audio distortion they discussed cancer cures being suppressed; I mentioned the FDA hounding Dr. Burzynski's cure is being embattled. The audio distortion in my head became beyond unintelligible, then my Internet connection itself became becoming sketchy. As we were discussing Mysterious Hums, CC mentioned the World Hum Map and Database Project. Kat quickly mentioned elongated skulls. I never did get a chance to discuss Aaron Russo's feature documentary America: Freedom to Fascism, which exposes numerous and various crimes being ongoingly committed by the government. There is also the feature documentary Zeitgeist I'd wanted to mention. I gave out my website's Paranormal View hub page at which one can find the show's respective report pages, the show's official website and that we're very findable on Facebook, and my Followable Twitter presence. 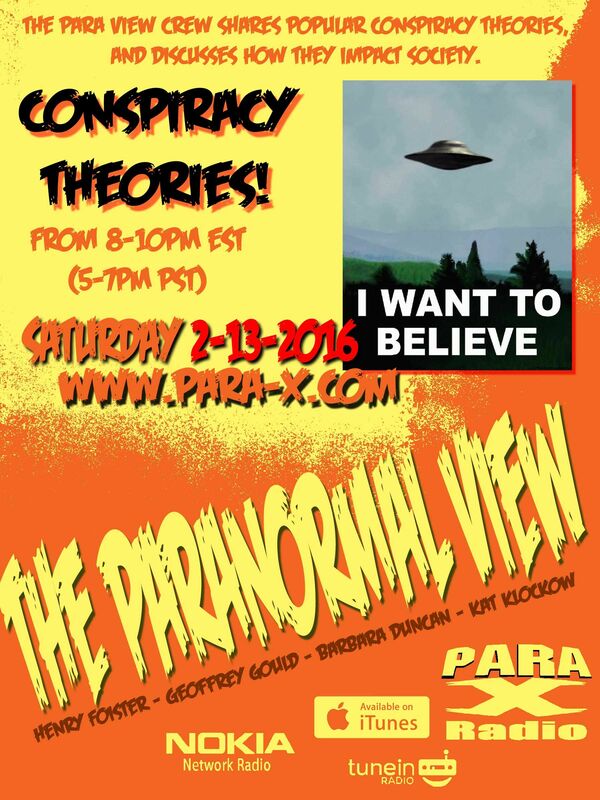 Kat gave out her own website, the show's @Paraviewradio Twitter presence, that we/the show can be emailed at theparanormalview@gmail.com; that the show is also available on iTunes, and her @katklockow information, and her @jinxedcomic Twitter accounts. Ceiling Cat Barbara Duncan can be Followed on Twitter @EllenSmythee. Henry announced that the following week we would have the GhostSoldiers, and we wrapped out.